March 30, 1967: The Beatles are in a photographer’s studio shooting the cover art for Sgt. Pepper’s Lonely Heart’s Club Band. We revisit the making of this iconic album cover, courtesy of Scott Freiman who leads our “Deconstructing the Beatles” series. It’s one of the most famous album covers ever produced — The Beatles’ Sgt. Pepper’s Lonely Hearts Club Band. 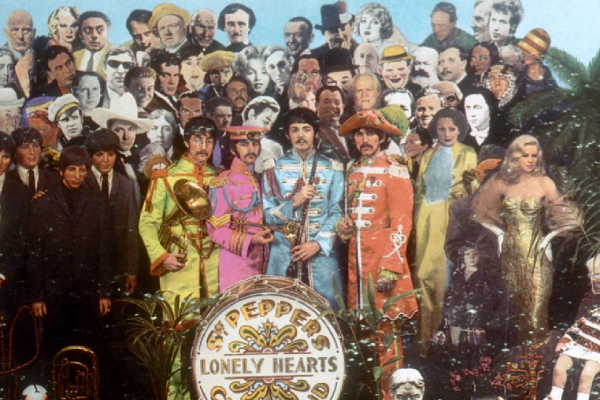 On the cover of this 1967 masterpiece, the Beatles stand in front of a Sgt. Pepper bass drum dressed in colorful costumes. They are holding brass and woodwind instruments and are surrounded by images of other celebrities, flower formations, and other assorted objects, including wax figures of their earlier selves. New information has recently surfaced that may reveal the inspiration for this memorable album cover. Back in 1966, the Beatles had decided to give up touring and become a studio-only band. This was an extremely risky move for the Beatles since no successful band had ever given up touring. When the Beatles entered the studio in November of 1966 to begin work on their first post-touring album, they already had several incredible songs written, including “Strawberry Fields Forever” and “Penny Lane.” But, with no new Beatles release imminent, their manager Brian Epstein and producer George Martin decided to release the two songs as a single and leave them off the next album. There is even an interview in a Swedish hotel where the Beatles are listening to the Mercblecket EP. “I really like this one,” says McCartney. “They really got the beat. It’s really great!” So, did Mercblecket inspire the Sgt. Pepper cover? It’s certainly plausible that it was one of the inspirations for the cover. But until Sir Paul comments on this story, we’ll just chalk it up to another Beatles mystery. Great cover. How many can you name? I heard this album the first week it came out with my girlfriend at the time. She turned me on to the Beatles after seeing “A Hard Days Night.” Marlon Diedrich 9/3016. Dion on the cover days that John Lennon told him how much he liked Dion’s hit single Ruby Baby and Dion figured that’s why he’s pictured on the cover of Sgt. Pepper . I have a photo of President Theodore Roosevelt taken in 1906 that also could be an inspiration for the Sergeant Pepper album cover. I’d be happy to send it along if I knew where to send it. You missed the grave of the “old” Beatles at the forefront. I can agree with all theories here…. We all know that Beatles were, self-admittedly, the greatest “pinchers” of musical ideas for their songs and often turned single lines or groove into whole new songs…. that were better than the strand they would start with. Here is the neat part, without the Pepper cover, we would have NEVER had a second look at either the picture of his father’s band or Mercblecket album cover, in a way, Pepper immortalized those two images, which would have been lost to time otherwise.